What do you do when the worst happens? Do you curl up in a ball? Do you rail at fate? Perhaps both of these, perhaps more. 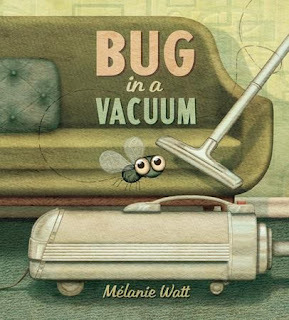 According to Bug in a Vacuum, a picture book by Mélanie Watt, you go through the five stages of grief as described by the Kübler-Ross model: denial, bargaining, anger, despair, and acceptance. The story follows a tiny fly who wanders into a house on cleaning day. The bug was enjoying life, minding his own business, exploring, and just as it reached the top of the world…the worst happened. It was sucked into a vacuum cleaner. At first the bug is confused, thinking that he is in an amazing new place. The truth slowly dawns on him that he is in reality trapped in a pretty dismal situation. He explains that he couldn’t possibly be in this situation on bowling night. He rails at the world. He curls up in a ball, and then he accepts his fate. But that is not the end. The story is told in short sentences and very funny, relatable dialogue. The subplot involving the dog who is going through the same five stages of grief is heart wrenching and can be found only in the illustrations. The illustrations themselves are full of amazing detail. When I read this book to my students, they connected to the fly’s body language and felt the ominous atmosphere inside the vacuum, but the pages are full of so much detail that you could read it over and over and make new discoveries each time. They didn't get the concept of the five stages of grief (they took the images very literally and thought Denial was a spray), but I don’t think they had to to get a sense of what a jam the bug was in. They understood the bug’s struggle without putting a name to grief. This book is rich with idioms like “on top of the world”, “something’s fishy”, and “wouldn’t hurt a fly” which could serve as a fun academic lesson for teachers and parents to share with their kids.